Finally got time to install the phone charger. 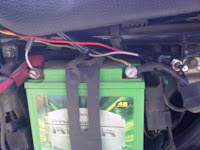 1 - Part that connects to battery. This has a round connector that is supposed to be connected to dashboard. 2 - Part that connects to Part 1 and has the voltage processing circuitry to bring down 12V to 5V. This can take additional tips so that you can charge different types of phones. Not sure if it has any kind of current limiter or protection.The part 1 could be designed in a better way. The round connector needs additional jugaad to put it on the dashboard. 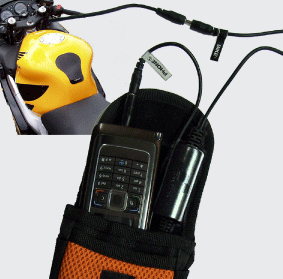 Because of the separable parts, you can remove the charger from bike when not required. - Added a switch and fuse in-line and kept this under the battery panel. Now its ready :) I can flip the switch when not in use and the charger would not get voltage. This is less convenient than having the charger always on with ignition switch in between. But works good enough!